Our Lady manifested herself through this statue to Sr. Agnes Sasagawa in Akita Japan. 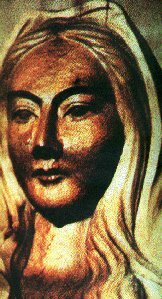 In 1973, the Blessed Virgin Mary gave Sister Agnes Katsuko Sasagawa in Akita, Japan three messages through a statute of Mary. Bathed in a brilliant light, the statute became alive and spoke with a voice of indescribable beauty. Her Guardian Angel also appeared and taught her to pray. The wooden statute from which the voice came wept 101 times over a course of several years. It also perspired abundantly and the perspiration sent out a sweet perfume. Its right palm bled from a wound having the form of a cross. Hundreds of people witnessed many of these events. Scientific analysis of blood and tears from the statute provided by Professor Sagisaka of the faculty of Legal Medicine of the University of Akita confirmed that the blood, tears, and perspiration are real human tears, sweat, and blood. They come from three blood groups: O, B, and AB. Sister Agnes also has stigmata on the right palm. A Korean woman with terminal brain cancer received immediate healing while praying before the statute in 1981. The miracle was confirmed by Dr. Tong-Woo-Kim of the St. Paul Hospital in Seoul and Fr. Theisen, President of the Ecclesiastical Tribunal of the Archdiocese of Seoul. The second miracle was the complete cure of total deafness of Sister Agnes. April, 1984 - Most Rev. John Shojiro Ito, Bishop of Niigata, Japan, after years of extensive investigation, declares the events of Akita, Japan, to be of supernatural origin, and authorises throughout the entire diocese the veneration of the Holy Mother of Akita. He said: "The message of Akita is the message of Fatima." June, 1988 - Vatican City - Joseph Cardinal Ratzinger, Prefect, Congregation for the Doctrine of the Faith, gives definitive judgement on the Akita events and messages as reliable and worthy of belief. "My daughter, my novice, you have obeyed Me well in abandoning all to follow Me. Is the infirmity of your ears painful? Your deafness will be healed, be sure. Be patient. It is the last trial. Does the wound of your hand cause you to suffer? Pray in reparation for the sins of men. Each person in this community is my irreplaceable daughter. Do you say well the prayer of the Handmaids of the Eucharist? Then, let us pray it together:"
"Please receive this humble offering of myself. Use me as You will for the glory of the Father and the salvation of souls." "Most Holy Mother of God. Never let me be separated from your Divine Son. Please defend and protect me as Your special child. Amen." " Pray very much for the Pope, the bishops and the priests." "My daughter, my novice, do you love the Lord? If you love the Lord listen to what I have to say to you." "It is very important. You will convey it to your superior." "Many men in this world afflict the Lord. I desire souls to console Him to soften the anger of the Heavenly Father. I wish, with my Son, for souls who will repair by their suffering and their poverty for the sinners and ingrates." "In order that the world might know His anger, the Heavenly Father is preparing to inflict a great chastisement on all mankind. With my Son, I have intervened so many times to appease the wrath of the Father. I have prevented the coming of calamities by offering Him the sufferings of the Son on the Cross, His Precious Blood, and beloved souls who console Him and form a cohort of victim souls. Prayer, penance and courageous sacrifices can soften the Father's anger. I desire this also from your community, that it love poverty, that it sanctify itself and pray in reparation for the ingratitude and outrages of so many men. Recite the prayer of the Handmaids of the Eucharist with awareness of its meaning: put it into practice: offer (whatever God may send) in reparation for sins. Let each one endeavour, according to capacity and position, to offer herself entirely to the Lord." "Even in a secular institute prayer is necessary. Already souls who wish to pray are on the way to being gathered. Without attaching too much attention to the form, be faithful and fervent in prayer to console the Master."